Your vacation tour of Finland, Estonia, and Sweden traverses the Baltic Sea to show you some of the world’s most beautiful settings. What’s more, you’ll find less crowds along the way during this off-season tour. Begin in Finland’s southern capital of Helsinki—a modern metropolis with an historic richness you’ll discover on your guided sightseeing tour. See the city’s impressive sights, from the Presidential Palace to the Olympic stadium, and visit the impressive Lutheran Cathedral and Rock Church (subject to availability). Browse an indoor market to enjoy Finnish food, culture, and traditions. 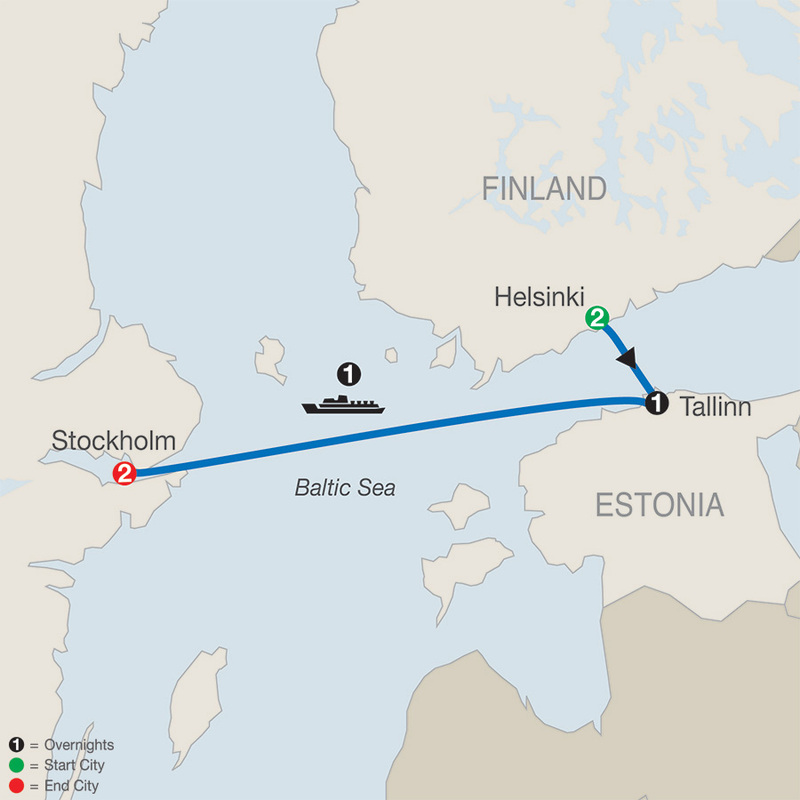 You’ll travel by ferry across the Gulf of Finland to Tallinn, Estonia. Here you’ll discover one of the “Pearls of the Baltic” with a Local Guide to show you the Hanseatic Old Town, and its domed cathedrals. Enjoy time to explore this ancient, cobblestoned city before boarding your Baltic Sea cruise ship sailing for Sweden. Arrive in Stockholm, settling on 14 islands between Lake Mälar and the Baltic Sea. Enjoy morning sightseeing with your Local Guide, featuring the Royal Palace and Ridderholm Church—the resting place of Swedish monarchs. You’ll also tour the Old Town and City Hall—site of the Nobel Prize ceremonies. Enjoy free time to explore Stockholm, and join in a celebratory farewell dinner to complete your guided vacation in Finland, Estonia, and Sweden. DAY 1 Arrive in Helsinki, Finland. DAY 4 Tallinn. Baltic Sea Cruise. Sleek Business-oriented Hotel with striking glass facade & atrium. This quirky design hotel has a brightly coloured interior theme with circus-inspired touches. Board games and magazines are available in the library lobby bar, there is a gym and Nordic walking sticks and bikes can be rented from reception. A sumptuous buffet is served in the breakfast room each morning and a choice of four different restaurants serving fine and casual dining can be found in the adjoining complex. Located on the edge of Tallinn's charming medieval Old Town, this 93-room hotel conveys an upbeat mood and ambience with its fresh, bright and cheerful décor. Each floor has its own Coffee Lounge with snacks and a book corner. This modern 392-room hotel enjoys a fantastic location in the heart of Stockholm and features a rooftop bar and seasonal outdoor terrace with impressive skyline views. A trendy urban style restaurant serves market fresh dishes and there is a lobby bar and cafe serving all day snacks and coffee , for fitness there is a gym and for connectivity Free Wi-Fi access is available throughout the property.